successful trader is by using a mechanical trading system. MECHANICAL TRADING SYSTEMS. A mechanical trading system is a set of exact rules used to enter and exit trades. These rules are usually based on price action. Our systems are simple and straightforward. If you can do 6th grade math, you can probably use most of our systems. If you are looking for a TREND FOLLOWING investment process, holding futures positions for a few weeks at a time, one which requires minimum amount of monitoring, see our RUBICON System based on the work of Old master  Charles Keltner. If you are looking for a more active short term, SWING TRADING system, holding trades for a few days at a time, see our updated UNIVERSAL 2.0 system. Designed by my well known father, John R. Hill in the early 1990's. Updated to today's more volatile conditions. WE HAVE A SPECIAL INTRODUCTORY PRICE RIGHT NOW . Are you a ROOKIE TRADER? OR, looking for a good STARTER system? Check out the RE-released UNIVERSAL 1.0 system. This system comes with a full 30 day MONEY BACK GUARANTEE. After the dramatic price drop and rally of late August and early September, stock indices prices had been congesting for three days prior to September 15. This presents the potential to take a trade on the breakout of that congestion. 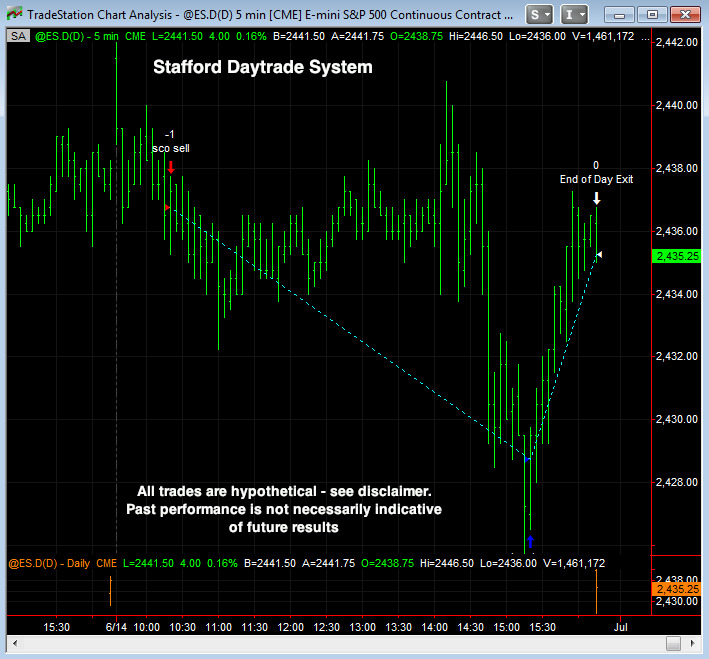 The Stafford Day trade system presented opportunities in all three mini indices. Getting long all three on the breakout off the opening. Holding these trades until the close. Of course past performance is not necessarily indicative of future results. Trades must be labeled hypothetical as they may or may not have been taken in real-time. This is for educational purposes only. (Atleast) $13.32 has been deducted from each trade for commission and slippage. No Fees. Of course, PAST PERFORMANCE IS NOT NECESSARILY INDICATIVE OF FUTURE RESULTS.